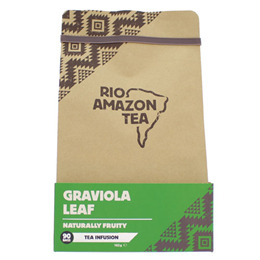 RIO AMAZON Graviola is becoming increasingly well known as a source of antioxidants called annonaceous acetogenins. Graviloa tea is prepared from the leaves of the plant. Graviola (Annona muricata) is a small evergreen tree, 5 to 6m high, with large, dark green, glossy leaves that is native to the Amazon rainforest and other tropical areas of the Americas. It produces a large, heart shaped edible fruit that is 15 to 23 cm in diameter, is yellow-green in colour, and has white flesh inside. In Brazil, the juice is a popular drink, and is known as Guanábana. Shredded Graviola leaf (Annona muricata). Infuse 1 teabag in a cup of boiling water for 3-5 minutes. Sweeten with honey or sugar as desired. If used in high doses – supplementation with a probiotic is recommended. Graviola should be avoided or used with caution by those on medication for high blood pressure. Taking Graviola at the same time as Co-Q10 supplements may reduce the herbs effectiveness. Not advised for use when pregnant or breastfeeding. 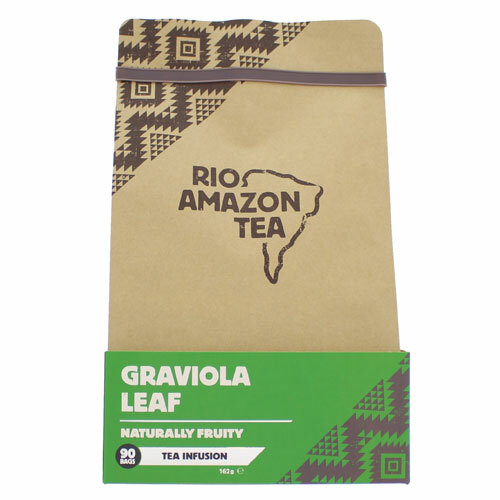 Below are reviews of RIO AMAZON Graviola Leaf - 90 Teabags by bodykind customers. If you have tried this product we'd love to hear what you think so please leave a review.